Pagans follow the old polytheistic traditions, spurning the Abrahamic and Indian religions' talk of a segregation between physical and spiritual realms in favor of polytheistic physical gods. Paganism normally requires the Old Gods or Holy Fury DLC to be playable. Bön is also unlocked by Jade Dragon, and Horse Lords allows playing pagan nomadic rulers. Without Holy Fury, Hellenic paganism requires the use of exploits or the Ruler Designer to play. Historically, the pagan faiths were gradually supplanted by Christianity, Islam, and the Dharmic religions, but this does not necessarily happen in the game. Pagans may fight back in the name of the old gods, and even seek to eliminate the monotheists from Europe. In game terms, all pagan religions fall into one of two broad groups, with a few exceptions - the offensively-oriented Germanic, Hellenic (Greco-Roman), Tengri and Aztec faiths, and the defensively-oriented Romuva (Baltic), Slavic, Suomenusko (Finnic), West African, and Bön (Tibetan). The Zunist are unique in the fact that they are something of a hybrid of the Offensive and Defensive and the generic Paganism grants no bonuses. Powerful Pagan CBs allow Pagans to expand quickly. Large realms, however, are unstable due to elective gavelkind (if tribal), difficulty converting characters and provinces, higher priority for independence factions, and a large Short Reign penalty. The ability to raid makes some pagans uniquely wealthy in the early game. Germanic pagans do especially well since they get free ships, can navigate rivers, and are close to prime raiding targets. But later, feudal realms grow their income more quickly, while raiding becomes less feasible as targets consolidate. Feudal rulers bordering rivers will eventually increase their fort level to the point that Germanic pagans can no longer navigate those rivers. Defensive attrition is a powerful deterrent in the early game. However, it only applies to the homeland, and pagans have difficulty converting provinces due to low moral authority. Defensive attrition is completely negated once attackers reach Military Organization 4. Pagans find it difficult to switch from tribalism unless they start as feudal (Balkan states and Zunists). Tribal holdings can be upgraded quickly, but fully settled provinces can be upgraded more. Medium-sized tribal realms can muster unusually large armies by having a large demesne, and by calling vassals to war rather than raising levies. Large tribal realms do not benefit as much since vassals of vassals cannot be called. Pagan territories are usually significantly technologically behind all other culture's territories, with the exception of the Germanic having a tremendous lead in shipbuilding at the start of 867, as well as receiving said bonus after some time at the 769 start. Foreign missionaries become more effective as tribal rulers decide they are ready to feudalize. There is hope, however: should the Pagan faiths become reformed, the faith's survival is almost set in stone. You trade some of your offensive/defensive capability for stability, faster conversion, and Great Holy Wars to combat Crusades and Jihads. Also, nomads are often an exception due to their unique mechanics. They can easily convert provinces by pillaging every holding in a province. The resulting empty holding slots further strengthens the horde. Nomads have their unique nomadic succession which does not split the realm like gavelkind. Large nomadic realms continue to grow in strength as long as the khans continuously increase the empty holding slots they control. Most pagans may raid neighboring provinces (and coastal provinces, if ships are available) for loot and prestige, even without a tribal government (which majority of the pagans are). ambition, unlimited use of subjugations within the target kingdom until the kingdom is created. Subjugation wars conquer or vassalize all territory within a de jure kingdom. The County Conquest CB is usable on any neighboring province not of the same religion, and carries with it a truce lasting only 5 years. Germanic pagans can additionally use this on any coastal province after the start of Viking Age in the year 800. Most pagans have defensive attrition, massively reducing the supply limit for non-pagans invading their homeland. This attrition only applies in provinces of the same religion as their ruler, so Germanic pagans won't lower their enemies' supply limits in Slavic territory. This severely slows down early-game conquest of the typically smaller, fractious pagan realms by expanding Abrahamics. However, invaders can negate the attrition by quickly building a fort in each province they enter, or by having Military Organization 4 in their capital. Tengri and Aztec pagans do not have defensive attrition (though Tengri invaders can ignore it). "Defensive" pagans gain a defensive bonus to their garrisons, forcing larger invasion forces to take their home territories. "Offensive" pagans get a bonus to their levy size (+30% levy size for Germanic, for example). Pagans have great difficulty holding large realms together. The short reign relations modifier is three times more severe for pagans. With tribal mechanics, pagans cannot raise Tribal Organization very high without having severe relations penalty for tribal Unreformed Pagan vassals (-30 for Absolute). They also cannot reform to Feudalism or a Merchant Republic unless they Reform or convert to a non-pagan religion. Pagan vassals are more likely to seek independence, and gain warscore more rapidly than others in independence wars. The default succession law for tribal pagans is elective gavelkind. However, you may convert to organized religion and change the succession law to the more useful (regular) gavelkind. The gavelkind succession law will remain even if you return to an unreformed pagan religion later. Those Pagans who start as feudal use gavelkind though they can switch to elective gavelkind too. This means that succession crises are significantly more likely without foreplanning. There are some exceptions, though. Zunists and Mongols may use Ultimogeniture; Bön may use both regular and elective gavelkind when tribal, and may also use primogeniture and ultimogeniture when feudal (or monastic feudal); Romuva/African may use Eldership; and rulers of the Celtic culture group always have the option for Tanistry. Pagans can grant themselves divorces at will, but with a significant cash payment for the divorce and a -30 relation penalty to the divorcee's family. Male pagan rulers may take up to three concubines in addition to a wife. Having young concubines (below the age of 45) gives a monthly prestige gain, which is especially useful for tribal and nomadic pagans. Pagans are able to hold religious feasts (except Tengri/West African). But, aside from Germanic/Zun, they are identical, except for slightly different flavor text and Slavic "Jarilo" event. However, all the random events based on traits (which drop relations by 15 for those without and raise by 15 for those with the trait) are the same, along with the end bonus of 100 piety and prestige and +15 to vassal relations for one year. Each one can only occur at a certain, and different, time each year. All pagan faiths permit female temple holders regardless of gender law; exceptions are noted below. The love of battle among these pagans means that rulers incur no relation penalty with their vassals for having troops raised. All Offensive pagans also gain a +30% bonus to their levy sizes, making up for likely lower technology and smaller fort holdings. Combined with not paying any penalty for raising their vassals' levies, this means offensive pagans can muster forces far beyond what their technological levels say they should. The other side of the coin is that peace is seen as unbecoming. Rulers who are neither at war, nor raiding, nor bound by an active truce lose a significant amount of prestige per month. Because raiding counts as war, and they have county conquest casus belli that require no reason for war, however, few rulers need find themselves short on wars for long. If that was the case simply raising levies and toggling looter and waiting will remove the prestige penalty. Germanic faith (more commonly known as Norse) is the faith of Scandinavian & Saxon people, worshiping deities like Odin/Wotan. Faith is widespread in earlier starting dates, among the multitude of petty rulers but is in decline from 1066 onwards. The last playable Germanic ruler available is Arnfast of Västerbotten, who dies in 1309. While three of the faith's holy sites are in Scandinavia, the other two are in mainland Europe and often held by strong Christian rulers. Keeping moral authority high is also a problem due to weak realms who often lose religious wars. Charlemagne DLC's scripted invasion of Saxony by Karl of West Francia), all Catholic and Germanic rulers will receive a pop-up that the Catholics have burned the holy site of Irminsul, causing the Germanic faith to lose 10% moral authority for 10 years. Germanic faith may use the county conquest CB against any coastal province belonging to anyone not of their own faith—Muslim, Christian or even other non-Germanic pagans are fair target—no matter how distant. Germanic pagans have a feast where they can sacrifice any prisoners taken to their gods. (This can be a fun event for some, especially if you just invaded France and now have 73 Catholic bishops in your dungeon, or just put down your 7th catholic revolt and have a half-dozen heresiarchs in your dungeons.) This is the only feast where piety and prestige gain are not set, and with sufficient sacrifices, can be quite significant. When you call any vassals who are not of your religion must pay 20 gold not to attend, or just refuse. Even a few vassals paying easily recoups the cost to call the blot, and with many vassals you can get hundreds of gold per blot. The Blot itself begins like any feast, but after it begins, there are successive events in which you hang prisoners in your dungeons to honor the gods. There are 7 kinds of flavor text: 1 for Muslims, 1 for Christians, and five for Pagans. For each Muslim or Christian sacrificed, you gain 50 prestige and 25 piety, and pagans give you 25 prestige and 10 piety. You may spare a prisoner for a cost of 25 piety if you so choose. There is a limit to 4 prisoners per blot. After the sacrifices, flavor events are the same as a standard feast. Blots have an additional "cooldown time" of 9 years. It is possible to use Blot to earn the Holy Smoke achievement. Germanic rulers may announce invasion on specified target and call adventurers from all over the Norse world to serve in their expedition. (Functionally creating an event army stack that grows every few months until the invasion is launched.) Prepared invasions can also be called by vassals. However, if the game starts at 769, they must wait for a special event to grant Shipbuilding II before they can rain havoc on Europe. Runestones are available for Germanic religion of North Germanic culture. Raising a runestone costs 100 gold and will give you a global +10 relation bonus for two years. Upon declaring the intent to raise a runestone, you have the choice of either commemorating a parent or your own accomplishments. Eventually an event triggers (often in the 1100s) that informs you that paper has replaced runestones, disabling creation for the rest of the game. Germanic pagans are masters of coastal and river warfare. They may sail up navigable rivers, and even cross overland portages between major rivers. (This allows them to functionally travel directly through Continental Europe by boat into the Caspian or Black Seas, and through there to the Mediterranean.) Increasing fortification levels in later years may start to block this. On top of 30% levy increase, Unreformed Germanic also gain a +50% retinue supply bonus, but lose this bonus upon reformation. Any established retinues remain and can be reinforced until dismissed. trait by sacking holdings, if The Old Gods is active or after reforming with the unique doctrine "Sons of Ragnarok". The Viking trait and its upgrade improve martial skill and Germanic opinion. The religious head of the reformed religion is the reformer, rather than a vassal theocracy. Hellenic paganism was the faith of the Greco-Roman world before the rise of Christianity. A Christian Emperor of Greek, Italian or Roman culture who restores the Roman Empire has an opportunity to restore Hellenism. 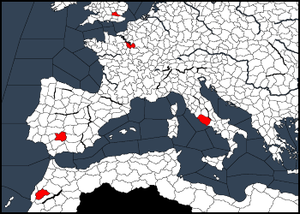 If you are a non-heretical Christian, of Greek, Italian, or Roman culture, your capital is located in Southern Europe, you completely control a Hellenic Holy Site, and have chosen scholarship focus or have the Insane, Possessed, Mystic, or Scholar traits, you will have access to a new decision: Delve into Classics. When taken, this decision allows a character to go through a short event chain allowing you to convert to Hellenic paganism. Even unreformed Hellenism shares some features of organized religions: it allows unrestricted succession and crown authority laws, and lacks defensive attrition. However, the religion must be reformed in order to demand religious conversion. Hellenic pagans have access to the county conquest CB, but not the holy war or pagan subjugation CBs. If the Hellenic religion has been reformed, any independent Hellenic king-tier ruler may create the Myrmidons, a Hellenic holy order, if they either completely control all the holy sites or the year is at least 1100. Characters are assigned Zodiac traits on birth and by decision. Access to Hermetic society. Diviner read signs before a war to try to improve troop morale. Characters may be disqualified from succession by granting them temples. Holy Fury, Hellenic pagans can dedicate direct vassal temples to one of 12 gods via title interaction. Dedicating a temple costs 250 gold and 200 piety. Dedicating a temple gives a temporary character modifier for 10 years, and adds a shrine, a unique building, to the temple permanently. You can only dedicate a temple once. Syrakusa: The birth place of famous philosopher and physicus Archimedes. It is located on Sicily. Thessalonica: Thessalonica was the capital of all the Greek provinces of the Roman Empire. In this province also lies Edessa (Vodena), the first capital of ancient Macedon. Athens: One of the world's oldest cities, Athens is the location of the Parthenon. Rome: Location of the Pantheon, the "temple of all the gods". Alexandria: Alexandria was the intellectual and cultural center of the Hellenistic world. Tengri, worship of the Sky Father, is the religion of the Steppe and the bulk of its followers are nomads, whose lands stretch from Danube to Mongolia. 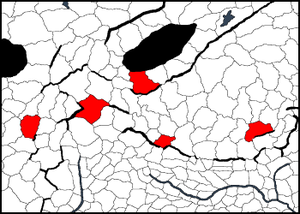 While its holy sites are in locations which are easily taken, most of them lack a temple holding which means holy sites only give half of the usual Moral Authority, forcing Tengri rulers to either build temples or take control of all holy sites. However, the Tengri faith does not die out during the entire period of the game and there are always relatively strong rulers for it in the game. This is the same religious decision that defensive pagans have. Tengri rulers ignore the defensive attrition associated with most pagan religions. Nomadic Tengri may perform Sky Burial. Tengri religion gives +30% defensive/offensive power to light cavalry units on top of the Levy bonus. Tribal rulers who are Tengri (or Altaic culture) also have a slightly different troop composition for ”Raise Tribal Army” decision. Tengri paganism does not permit female temple holders. Tengri rulers may intermarry with Buddhists and all religions in the Zoroastrian group. Sunset Invasion DLC is in use. Aztec religion has no special mechanics, having the usual set of Offensive Pagan mechanics. Reforming the Aztec faith is possible but extremely difficult. Acquiring the faith to begin with requires you to convert religions or use Ruler Designer, and its holy sites are split up between Italy, England, Spain, France, and West Africa. Aztec pagans can sacrifice non-Aztec characters from controlled provinces to the gods. It is possible to use Aztec human sacrifice to gain the Holy Smoke achievement. Aztec pagans gain access to the Tribal Invasion CB, allowing unlimited wars for entire de jure kingdoms at a time. Aztec pagans gain 30% to levy size. Aztec paganism does not permit female temple holders. The principal ability of defensive pagans (Romuva, Slavic, Suomenusko & West African) is a tremendous boost in combat when fighting on home ground. All units gain 80% to defense when fighting enemies in a province of the combatant's religion. This applies even when one is the attacker, and on territory held by another lord; Only the dominant religion of the province you are standing upon matters. This means you may invade territory held by another faith, but still gain the defensive bonus so long as the battle takes place upon land of your faith. (Such as reconquering Slavic lands as a Slav from Christians.) This allows defensive pagans to defeat enemy armies twice their size with ease. Defensive pagan holdings also have larger garrisons (bonus varies per religion), making them harder to siege. This is in addition to the pagan homeland attrition penalty, which forces the large numbers of troops needed to invade a defensive pagan home territory to face severe attrition for the duration of any siege. Such penalties usually function to prevent any rival faith from taking their lands in spite of being relatively weak and of a rival faith that normally could be easily holy warred. The pagan homeland attrition penalty does not function, however, against other unreformed pagans. This allows other pagans (especially Tengri and Germanic pagans) to fairly easily invade other pagans with conquest and subjugation casus belli. The homeland attrition penalty does apply to reformed pagans of another faith, but the "old faith" heresies have no such protection against the reformed churches of their specific branch of paganism. All defensive pagans have access to Ancestor Worship & Choose Patron deity decision. Additionally, those defensive pagans who are tribal, may call forth Devout Warriors. Ancestor worship is a decision that can be taken every 10 years. In it, you ask your ancestors for various favors and offer them sacrifices, either money or human, to make sure they answer your calls. The outcome of sacrifice is always somewhat random but various decisions you do increase your rulers piety nonetheless. Defensive pagans may choose a patron deity. This gives +2 to one ability and -1 to another. In addition to this, several events dedicated to said deities can trigger. This decision is available for defensive tribal pagans, whether religion is reformed or not. If you are attacked by ruler of different faith, you can spend 200 piety to summon up a group of warriors to defend your realm, much like with Raise Tribal Army decision. This decision will raise 2000-men strong troop, which means that each point in Piety is worth 10 soldiers for a defensive pagan tribal ruler. Romuva is the faith of the peoples on the east coast of the Baltic Sea, worshiping such deities as Dievas, Perkunas, and Laima. 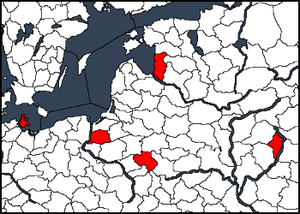 Three of the religion's holy sites are located within de-jure Lithuania, making it perhaps the easiest pagan religion to reform. Romuva does not disappear from the world at any starting date but will eventually get pushed back by Christians. After the 1200's, most of Lithuania is feudal and by 1337, it stands as the last pagan kingdom in Europe, surrounded by Teutonic Order, Golden Horde, Poland and Novgorod. AI Romuva rulers and Romuva provinces have increased resistance to conversion from organized religions. This functions as standard pagan feast, granting ruler 100 piety & prestige. Unreformed Romuva pagans get +10% to levy size and +30% to garrison size. Both bonuses change to +20% after reformation.
. Reformation either removes this ability or expands it to feudal realms, depending on the chosen doctrine. Rugen (shared with Slavic): The fall of this important pagan center to Christianity in the 12th century had opened the crusaders a straight route along the sea to the rest of the Baltic region. Chelmno: After Chelmno was repeatedly sacked by the Old Prussians, the Polish duke Conrad I of Masovia gave it and the surrounding region to the Teutonic Knights who proceeded to use it as a center from which to invade Prussia. Riga: The city of Riga was an extremely important German town from which Christianity was spread to the wider Baltic region. Podlasie: Inhabited by the warlike Yotvingia tribe, also known as Sudovians. They launched frequent raids on Poland, until they were conquered by the Teutonic Knights. Bryansk: One of the easternmost regions controlled by the Grand Duchy of Lithuania. The Slavic faith is followed, as the name suggests, by the Slavic peoples of Europe. The faith is widespread in early starting dates, and some of the realms, such as Croatia, are already feudal rather than tribal. However, the religion's holy sites are scattered far and wide making reformation very hard. The Slavic faith is almost gone in the 1066 starting date, and the faith disappears from the world entirely by 1200. The last playable Slavic ruler is Chief Testislaw of Dyrmin. This is like other pagan feasts, but one of the guests (chosen at random) becomes a "Jarilo" which improves said vassal's relations with you by 25. Unreformed Slavic pagans get +10% to levy size and +30% to garrison size. Both bonuses change to +20% after reformation. Holy sites: Novgorod (shared with Suomenusko), Kiev, Plock, Birlad, and Rugen (shared with Romuva). In the north, start in Novgorod, Poland, or Kiev and form your corresponding de jure kingdom first, then work your way to the other two holy sites. In early start dates Kiev is vulnerable to Tengri nomads (it borders the Magyars), so you may find that fabricating a claim to conquer Rugen is an easier way to get your third holy site. Ilmen in 769 already holds Novgorod as its capital, is a decently strong start, and has the advantage of being able to flip to Russian culture once the faith is reformed, allowing the acquisition of the "Russkaya Pravda" achievement. 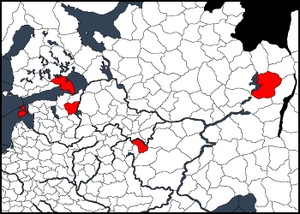 Ilmen is also surrounded primarily by weak Suomenusko and Romuva pagans and is shielded by an ocean from the Norse until the Viking Age event triggers, giving plenty of time to solidify power. Kiev in 769 is notably a start whose default ruler, Dobrava Turov, is a woman. Playing from this start is more difficult, as Kiev is bordered to the south by the Tengri Khaganate of Magyars. Rurik Rurikid, Petty King of Holmgarðr in 867, is the historical founder of the Russian Empire. He is a culturally Norse Germanic pagan but has a Slavic son. You can use the Germanic faith's powerful CBs and shipbuilding buffs for expansion and raiding, then be succeeded by a Slavic ruler and reform. Suomenusko, religion of the Finno-Ugric people stretches from the Baltic Sea to Siberia. Its holy sites are scattered around the map but are mostly controlled by right religion, even in 1066 starting date. The easiest route to reform the faith is with a Finnish ruler as de-jure Finland has two holy sites. The nearby county of Novgorod has a third holy site, which can be conquered relatively easily. Bear in mind that in 1066 Novgorod is Christian and Rurikid dynasty which holds it, has multiple potential allies from other dynasty members. Suomenusko retains a sizable number of provinces throughout the game and it is very easy to put the fear of Ukko to other religions, whether you start in 769, 867 or 1066. 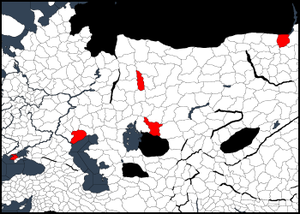 However, by 1337 only two chiefs in northern Finland/Sweden follow the faith, with the rest of Finno-Ugric lands being divided between Catholic/Orthodox Christians and the Sunni Golden Horde. This functions as a standard pagan feast, granting ruler 100 piety & prestige. Unreformed Suomenusko pagans get +40% to garrison size. 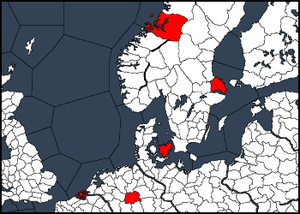 Reformed Suomenusko pagans get +10% to levy size and +30% to garrisons. 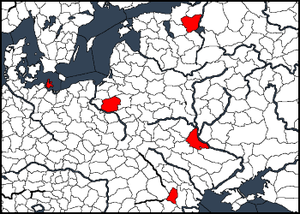 Holy sites: Perm, Ryazan, Novgorod (shared with Slavic), Saaremaa, and Kexholm. The African faith is followed by the peoples of sub-Saharan Africa. 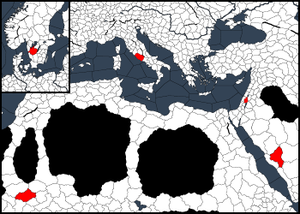 The faith is in a strong position in the 769 start as north Africa is mainly ruled by tiny Muslim realms which can easily be conquered after consolidating your position in the south. In later starts, expanding north becomes increasingly difficult and by 1066, many rulers of the area have converted to Islam. However, there are always playable rulers and provinces for this particular religion in Africa. If a neighbor or liege follows an Abrahamic faith, you can spend piety to gain "Sympathy" trait for their religion group. Female rulers may take up to three male consorts. Unreformed African faith does not suffer from extra "short reign" penalty like other non-Zunist pagans. African pagans, both unreformed & reformed, receive +40% to garrison size. Holy sites: Djimi, Draa, Gao, Kano and Wagadu. Sons of Abraham demon child event chain will create Zunist "witches", who can be married matrilineally or assigned as guardians to children with the Faith or Heritage focus. Rulers with Zunist holy sites in their demesne may also secretly convert to the faith. Monks and Mystics, Zunists characters may join the Hermetic Society. Zunists are able to intermarry with members of the Mazdan and Eastern religion groups. The strongest of these are Hindu, who will reject marriage arrangements due to your lack of caste. However, Hindu rulers will allow you to take concubines, who you can then decide to marry. Another solution is to convert to Hinduism so you can acquire the Kshatriya caste, then convert back to Zunism. Like other pagan feasts, this gives ruler piety and prestige. However, it also has the event "Walking under the Sun" which has a chance of giving traits to your ruler. In addition to usual choices of execute/ransom/release prisoner, Zunist can leave prisoners to a desert to be "judged by the sun". This usually kills said prisoner but a few other outcomes are also possible. 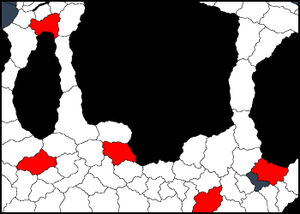 Zunists receive increased levies (+30%) & defensive attrition in Zunist provinces and better combat power (+20% defensive/offensive) for heavy infantry units. Unlike defensive pagans, they do not receive 80% defensive bonus in home provinces. This achievement is earned by ruling an empire-level title as reformed Zun ruler in an Ironman game. Zunism does not permit female temple holders. Holy sites: Nishapur, Bost, Cairo, Kabul, and Multan. Cairo is distant and usually controlled by major Muslim powers. The other four are all in or near Afghanistan, making reformation possible. Changing culture: Raiding temples can help you gain the moral authority needed for reformation with only four holy sites nearby. Unlike other Pagans, feudal Zunists are unable to raid, but there are several cultures which allow raiding. Altaic culture group is the obvious choice due to the number of nomadic realms north of Afghanistan. Altaic group allows Tribal Invasions if independent, which will permanently allow kingdom-level wars, a must-have for conquest. Norse is potentially desirable, because its cultural buildings and cultural retinues benefit from the Zun faith's +20% offense/defense to heavy infantry. The Varangian Guard, if the Byzantine Emperor forms it, can supply Norse educators. There are provinces with Bön faith in Tibet throughout the game but last playable rulers vanish in 1251, leaving Buddhists ruling Tibet. The strongest position for the faith is at the 867 bookmark, where the Tibetan Empire has fractured and Bön kings of Guge & Ü-Tsang hold large areas of the Tibetan plateau under their control. Bön receive +40% to garrison size. They also receive Defensive Pagan bonuses and their enemies suffer attrition in provinces with Bön religion. Bön may intermarry with members of the Mazdan and Eastern religions group and with Nestorians. Rulers of Bön faith do not suffer from extra "short reign" penalty. AI Bön characters and Bön provinces have increased resistance to conversion from organized religions. Shared with Dharmic religions; lets you hire a skilled courtier as Court Guru. Sympathy for Eastern religions trait for a cost of 50 karma, reducing penalties involved in situations where you rule over non-Bön people. 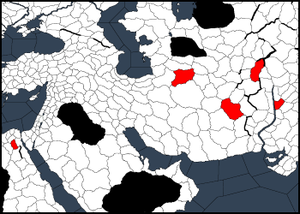 Holy sites: Balkh, Gilgit, Lhasa, Purang and Khotan. There is one special pagan faith that normally only appears in-game as the listed religion of long-dead historical figures. It is not normally playable (even with Ruler Designer), but can be played using mods or by exploiting loopholes. Before patch 3.0, Hellenic paganism also fell into this category. A generic Pagan faith is used in the history files to represent everyone from pre-Christian Irish kings to pre-Islamic Arabs. This faith is exceptionally limited - it has all the disadvantages of unreformed paganism and none of the benefits, nor can it be reformed. Generic Pagan rulers cannot be created with Ruler Designer but there are few events in game which spawn Pagan courtiers to game, which permit granting of titles or education of children. Västergötland: The "Thing of all Geats (Goths)" was the Thing (general assembly) which was held from pre-historic times to the Middle Ages in Skara, Västergötland, before the province became a centre from which Christianity spread to the rest of Sweden. Mecca: Even long before the rise of Islam it was revered as a sacred sanctuary and was a site of pilgrimage. The Kaaba was thought to be at the center of the world, with the Gate of Heaven directly above it; the embedded Black Stone was a further symbol of this as a meteorite that had fallen from the sky and linked heaven and earth. Jerusalem: Before becoming the Holy City of the world's three largest monotheist religions, Jerusalem was a Canaan city dedicated to Shalim, the god of dusk. Ghana: Koumbi Saleh was an important Muslim city and the royal capital of the Ghana Empire which displaced all previous pagan religions. The lack of a formal religious tradition means that pagans have a harder time spreading their faith outside pagan lands. Seers (court chaplains) have a significant penalty to the chance to convert provinces on top of their likely-lower moral authority, and vassals cannot be demanded to convert. Inversely, it is much easier for organized religions to convert pagans. Foreign rulers will sometimes send missionaries. If allowed to spread their religion, they will in time ask the ruler to convert. Pagans being attacked in a holy war by Christians or Muslims may choose to save their realms and end the war by accepting the faith of the invaders. Lastly, pagans may, by decision, convert to the religion of a spouse or concubine of a different faith. Reforming a pagan faith establishes a formal religious hierarchy and scripture - adapting elements of the Abrahamic faiths in order to more effectively oppose them. In game terms, reformed pagans no longer face the restrictions on crown authority, succession, independence wars and conversion that other pagans do. The religion now has a formal head, who gives the faith a permanent +20% to moral authority, and who may, after the Crusades and Jihads are unlocked, call Great Holy Wars. The Germanic reformer becomes the Fylkir, a ducal-level secular leader similar to an Islamic Caliph. The other pagan faiths have a duke-level religious leader who becomes a vassal of the reforming ruler, similar to the Orthodox religion's patriarch. With the exception of the reformed Germanic religion, the faith will also immediately gain a holy order. heretics by the reformed faith, and may be targeted by holy wars. Note that reformed pagans may not send missionaries, the only organized religion group with this distinction. Reforming a faith costs 750 piety. It requires either control of three holy sites and 50% moral authority, or control of all five holy sites. If the last two holy sites are difficult to reach, the best way to obtain the necessary moral authority is through county conquests and raids. Each temple looted in a raid gives +1% to moral authority. Note that Germanic pagans have as a holy site the county of Braunschweig, and taking that county will trigger the Catholic crusades (as well as the formation of every Catholic Holy Order but the Knights Templar) at the time that you take Braunschweig, so long as the year is 900 and the province is Christian. If you need Braunschweig to reform the Germanic faith it is best to conquer it in 769, while the Saxons still control it. Reformed pagans will gain a sudden bonus to their conversion rates. In fact, if they have high moral authority, and have damaged rival religions' moral authority with their conquests and stolen holy sites, or control unreformed pagan lands, they will soon be flooded with notices of conversions of territories that are held by their vassals, who will put forth serious effort to convert their lands to their new faith. Reformed religions gain access to holy wars, usable on any target of a different faith (including other pagans). They also gain access to Great Holy Wars if the Catholics have unlocked Crusades or the Muslims have unlocked Jihads. GHWs are especially useful for Germanic Fylkirs, who can select the target and timing of the attack. For tribal pagans, reforming makes it easier to raise tribal organization. Tribal vassals who follow in reformation will no longer have opinion penalties for higher levels of tribal organization, no longer faction to lower tribal organization, and will usually vote in favor of increasing tribal organization. For feudal pagans, reforming makes it possible to raise crown authority to any level. Reforming also provides access to the full set of feudal succession laws. Reformed offensive pagans no longer lose prestige when at peace. The short reign penalty is reduced to merely double the normal amount for Germanic pagans among the same Germanic faith, but Old Germanic pagans will have the full -45 penalty in addition to the heretic penalty. Other pagan faiths have different modifiers. Reformed pagans no longer get a defense attrition bonus, and will incur attrition in the territory of unreformed pagans, except those who follow the old form of their own religion. Germanic rulers lose their retinue size bonus and now get penalties for raised levies like other rulers. Reformed religions lose access to subjugation wars, one of the fastest ways for pagans to expand. They keep access to county conquests and raids. Reforming the religion will cause a schism in the pagan faith. The reformer's courtiers at home, dynasty members, and vassals will always follow in the reformation if they are below playable tier. However, other rules will have a choice. (AI rulers are likely to accept the reformed religion if cynical, same dynasty as the reformer, or under control of a reformed ruler.) Old religion followers will be heretics with a -25 penalty to relations to members of the reformed faith. If a king of a faith stays true to the old ways, and many vassals convert to the new religion, this can cause tremendous upheaval in a nation, and lead to multiple, simultaneous and devastating deep revolts. Expect frequent raids and wars between realms that accept the new faith and those that reject it. Reformation tends to grant benefits of stability and the capacity to declare wars on larger-scale targets that smaller pagan nations couldn't attack, but lose many of the benefits that would help a small pagan nation expand more readily or defend itself from larger targets. As such, it is best used when the player is ready for their nation to "mature" from aggressive expansion against small targets to needing to maintain an empire. Because of this, it is usually strategically advisable to hold off on reforming your religion until your realm is at a multiple-kingdom level, and to make sure to exploit any subjugation or county conquest CBs against nearby easy target pagans before reforming your religion. Now that you have no fast way to expand through pagan lands, you may wish to convert to a culture that allows use of the Tribal Invasion CB, so you can quickly expand through infidel lands instead. Holy Fury expansion, requirements for reformation remain unchanged, but the player may select four "traits" for religion, which affects the set of available mechanics for the religion and provides various bonuses. With Holy Fury, the Hellenic and Bön faiths can be reformed. There are bonuses and restrictions which the reformed religion gains besides ones provided by selectable traits. However, some selectable traits could override these bonuses (see "Modifier" columns of tables below for the details). It is not clear whether saving of bonuses from unreformed offensive religions is planned by developers or it would be changed after version 3.0. Germanic +30% levy size. Viking traits. Coastal county conquest. Hellenic Concubines not allowed. Access to Hermetic society. Haruspicy and Astrology effects. Priests cannot marry and cannot inherit. Aztec No female temple holders. +30% levy size. Sacrifice action (unless Peaceful). Bloodthirsty Gods effects. Aztec Pyramid construction. African Women can take up to 3 consorts. Patron Deities, Ancestor Worship. Animistic effects. Abrahamic religions syncretism. Religion can have only one nature. AI rulers which follow Peaceful or Cosmopolitan doctrines will never convert counties of other religions, even if zealous. We must endeavor to lead a life of peaceful conduct and harmonious discourse with our opponents, rather than fall to the sins of violence and mad pursuit of power. +1 piety per month while at peace. AI rulers are less likely to start wars, plots and factions. Raiding unavailable if culture doesn't allow raiding. Holy wars and great holy wars are unavailable, but county conquest CB is available. Dueling comes with a Piety cost. Cannot create warrior lodge if it does not already exist. Our only way forward is paved with the skulls of our enemies! Only by showing their bravery in battle the faithful can hope to be rewarded in the afterlife! Ruler do not receive opinion penalties for raised vassal levies. AI rulers are more aggressive. Rulers lose prestige when at peace for too long. +20% levy size. +30% garrison size. +80% Defense and +80% morale for all units if fighting at county of this religion. +40% garrison size at county of this religion. Religion is resistant to proselytizing, Great holy wars are available. If there is levy size & attack bonus from unreformed religion, it is lost. One thing that the heathen missionaries have shown us is that it is not by the strength of weapons that the gods are preserved, but through the power of words. AI rulers will try to convert their counties. Lose piety when at war against faithful. There is only One Word, only one correct interpretation of our scriptures, only one way to please the gods. We must acknowledge that every people has its own protectors and that more often than not we all worship the same gods, just with different names and in different ways. Penalty to moral authority and to mission. Religious Control Mandate law is unavailable. Reformer picks two doctrines. Each pagan faith has one unique doctrine, which has features of two or more generic traits. These doctrines can be picked no matter the reformer's religion. The gods wrote our Fate in the stars. We only need to look up to know what lies within us. Characters are assigned Zodiac traits on birth and by decision. Only through the proper use of divination can we discern the will of the gods and lead our armies to victory. Our heavenly masters are cruel and ever thirsty. If we do not placate their hunger for flesh, blood, and souls they will turn their wrath upon us. Prisoners of different religion can be sacrificed for Piety. Incompatible with Peaceful and Proselytizing natures. The gods have chosen certain bloodlines over others. Such dynasties must be maintained pure if we wish to keep the favor of our creators. It is time that we acknowledge our concubines as full spouses. The children we have with them are just as legitimate as any other. Possibility for a woman to take consorts is disallowed even if other traits should unlock it. The gods do not care about the order in which a child is born, they care about the skills and virtues that he shows as a man. Both gods and goddesses rule the heavens, and so it is only just to allow both men and women to rule the Earth. Absolute cognatic succession is enforced. Full status of woman law is enforced. A woman can take up to 3 consorts. Government is not Merchant Republic. It is blasphemous to doubt the legitimacy of a ruler who has come to power under the favor of the gods. He should be shown immediate loyalty by his subjects. Short reign penalty is disabled. Ruler can spend piety to increase courtier attribute. The gods will only reward the bravest and most fierce amongst the faithful. To die in battle is the greatest of honors a man can aspire to. +10% Attack for all units. If there is levy size & attack bonus from unreformed religion or morale bonus from Animistic doctrine in first doctrine slot, it is lost. Incompatible with Unyielding and Peaceful natures. Spirits and magic are all around us, hiding inside every tree, under every river, flying above our heads and beneath the very earth we walk on. If there is levy size & attack bonus from unreformed religion, levy & garrison bonus from Unyielding nature or offensive bonus of Unrelenting doctrine in first doctrine slot, it is lost. Characters get a Rite of Passage when reaching adulthood. The gods have given us knowledge of the tides and of ship-craft so that we could use it to spread their word to all the corners of the world. Fleet can navigate through major rivers. Ship maintenance reduced to 10%. AI looter prefer coastal counties. Incompatible with Sons Of Ragnarok and Invaders doctrines. Partially redundant with Children of Perun doctrine. It is only through the strong and wise leadership of women that we will be able to fulfill the great destiny that the gods have in store for us. Enatic law & open succession law are enforced. Enatic-cognatic law is available. Agnatic, agnatic-cognatic, cognatic laws are restricted. No penalty for female ruler. No male in the council. Woman can take up to 3 consorts. It is only through the strong and resolute leadership of men that we will be able to fulfill the great destiny that the gods have in store for us. Agnatic law & open succession law are enforced. No females in the council. Matrilineal marriages are disabled. Our pious ancestors deserve our respect and veneration, it is only right for us to remember them fittingly. The religious head can decide upon death to venerate a given ancestor, in a process similar to sainthood. Eldership succession law is allowed. Ancestor Worship decision available. The most devout amongst us should be allowed to abandon their earthly affairs and spend their lives in seclusion and worship. Ruler can order subject to "Take the Vows", disqualifying them from succession. Priests cannot marry and cannot inherit. +2 Learning to any follower of the religion. We will allow infidels to live in our lands, but only as long as they pay regularly for their blasphemy by giving us offerings of wealth and resources. The wisest amongst us should be allowed to study other faiths and learn more about the people around us. Rulers can choose to gain sympathy with another faith by decisions. Incompatible with Dogmatic nature. The gods praise bravery and a free spirit. They encourage even the smallest man to reach for the stars. Prepared invasions are available. Incompatible with Peaceful nature. Pyramids were built many years ago by the ancients, we too should aspire to such lofty heights. These doctrines are tied to the reformer's religion. Some of them are stronger than the regular doctrines. For too long our tribes have squabbled against each other while our real enemies besieged us from outside. We must stand united or disappear forever! All the children of Perun will come together, sharing a new, harmonious understanding of the gods, so that we can live in peace and prosperity with our neighbors. The Endless Blue Sky beckons our armies to ride forward and spread to the four corners of the world, untamed and unstoppable! Levy size & attack bonus from unreformed Tengri faith will be lost. Incompatible with Unrelenting and Polygamy doctrine. We must stand strong to survive the assaults of the new religions. Only the best among us will survive to preserve the memory of the gods. We shall not wane into obscurity without a fight! The end times are near. Our people must prove their worth if they are ever to enter Valhalla! Daring + Sea-Bound Incompatible with Daring and Sea-Bound doctrines. In order for any spirit to get his due we must make sure that our priestly caste is qualified in all the spells and rituals scattered throughout our old traditions. Ruler can order subject to "Take the Vows". Priests cannot marry and cannot inherit. We must acknowledge the undeniable authority of the sun and its favored bloodlines in order to ensure the prosperity of our people. A balance of old and new traditions is the imperative requirement for an enlightened future, blessed by the favor of the gods. Our warriors must be ruthless and our armies unyielding if we wish to satiate the gods with the bountiful cattle roaming this New World. Levy size bonus from unreformed Aztec faith will be lost. We must remember that the gods are hardly ever interested in mortal affairs and that we should endeavor to maintain a detached attitude towards faith. Despite astrology possibly becoming part of the reformed faith, reformed pagans which are members of Hermetic society still suffer relationship penalty with temple holders. The selection of Leadership style determines the type of religious head. Secular and spiritual powers are inextricably bound. It is pointless to divide them between two offices. Reformer gets a powerful artifact. Player can select GHW timing. Prestige and piety bonus for ruler's dynasty. A High Priest should be given complete control over all spiritual matters, so that the gods may be pleased with the proper rituals. Duke-tier religious head common for all realms. Every realm shall have its High Priest, working alongside its ruler and fulfilling the needs of the gods and their followers. Every priest will be given the chance to give his proper interpretation of the new holy text, free from any centralized authority. Despite similarities between autonomous reformed paganism and Dharmic religions (followers of both has religious branch trait), the former still needs to deal with heresy (old pagan religion), while the latter has no heresies. Autonomous leadership bonus for an attribute depends on original pagan religion. -5 Opposite Trait -30 Zeal This character believes in adapting some of the features of the newer religions to [Root.GetHerHis] own worship of the old gods. -5 Opposite Trait +0.25 Monthly Piety -30 Zeal This character believes in detaching [Root.GetHerselfHimself] from worldly affairs in the pursuit for true enlightenment. +10 Personal Combat Skill +20 Ambition This character has interpreted [Root.GetHerHis] scriptures as a call to action against all the infidels threatening the survival of [Root.GetHerHis] faith. -5 Opposite Trait +10% Fertility +10 Honor This character believes that the true worship of the old gods is still best exemplified by the care that a [Root.GetManWoman] has for [Root.GetHerHis] own family. With the new reformation system, some synergies occur which present new abilities or opportunities to characters of this specific reformed religion. These are not immediately obvious before reformation, or even immediately upon reformation. The new reformation system allows players to build their religion for their preferred play-style and to combine incompatible characteristics. For example, players who seek to reduce internal conflicts in their country, but still want to expand their boundaries, could compose following culture/religion combination: Altaic culture, Tengri Paganism, Peaceful, Stability, Equality, Autonomous. Raiding culture allows the utilization of armies to raid while fabricating claims, and still get piety for remaining at peace. Generic Tengri paganism allows for more levies. Previously, all stable religions (Jainism, Buddhism) were restricted to use Seniority. Now, Stability may work well with Seniority succession law, because frequent change of rulers still would give you high score points, but now without the short reign penalty. Equality allows the player to not only land females, but also to get even higher scores since female dynasts could have consorts, who as concubines provides prestige. There, another bonus from raiding culture is revealed: In composition with Equality, not only kidnapping of princesses during raids benefits you with prestige from noble concubines and heirs with claims on successfully raided counties. Now, kidnapped princes becomes equally valuable. While consorts are available and Peaceful religion and Tribalist trait from Autonomous leadership outweighs short reign penalty (especially when player wants every vassal to be his dynast), it makes sense to pick Divine Marriage instead of Stability to get even more scores from sacred marriage in situations where inbreeding is already likely. Another approaches are to try new mechanics (To pick Haruspicy, Animism, Veneration) or to expand opportunities of faith (For example to pick Polygamy for Hellenism, which has no access to concubinage or to pick 'Children of Perun' trait for utilization of Russian major rivers for transfer of armies). If you have tribal government, it is recommended to choose either Agnatic Clans or Enatic Clans doctrine to avoid Gavelkind succession law. Enatic Clans doctrine is extra OP because you can create a super bloodline just by doing matrilineal marriages over a few generations.